Level 10 Items: How do they work? Yes, we're introducing level 10 items to the public alongside the next patch, "Upgrade 2.0". More 2.0 patch data and information will be available at a later date, but we expect to have it released by early April. So, how do these items work and why are they here? What are level 10 items? Level 10 items are the final path for an item from level 9 to 10. Level 10 items will only be applied to Weapons and Accessories. They will be displayed as the image above and will "change" into a level 10 item if equipped and entering a room. The stats on an item scale proportionately to the game's standards. So level 10 might have 3% higher attack time down, etc. This also affects first line skill. So your Attack Time down -27% will be 30% (3*10). 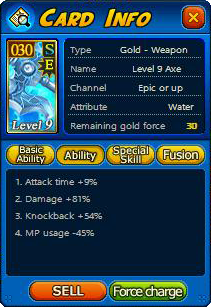 Upon using the card for a Skill Fusion, the card will change into an Event Card item. 39% will be the maximum for the level 10 item's second skill activation. The item will be skillable as if it were normal. When using a Skill Fusion (Lvl 10 Fusion) card, you will be greeted with a prompt in the lobby chat pertaining all the information regarding the fusion. multiplied by the current fusion rate if fusion mania is active (if not, the rate is 1.0). Currently, the state of SPGENS' economy is a little crapped out. With Upgrade 2.0, we plan to accelerate the curve for which a player can obtain Triple Max items (Lvl 9 + Max 1st/2nd Skill). We want the advanced and veteran players to be able to access something that is new and exciting, while assisting players who cannot join in PvP due to the item strength difference. Level 10 items will be a commodity and sought for as "the ultimate item" without heavily impacting how strong a player can be in relation to a near Triple Max setup. In addition to that, we are looking to do some rate changes as well as new ways to spend your code to make impactful changes to the SPGENS experience. Finally, I want to formally state that Level 10 items will never be apart of any donation bundle, GEN Coin or Cash System. We want to keep ALL level 10 items to be an accomplishment, not an easy way to become stronger. Of course, we are continually looking for feedback for this new mechanic. All data is subject to change. That's it! That's how Level 10 items will work. Best of luck hunting for them!